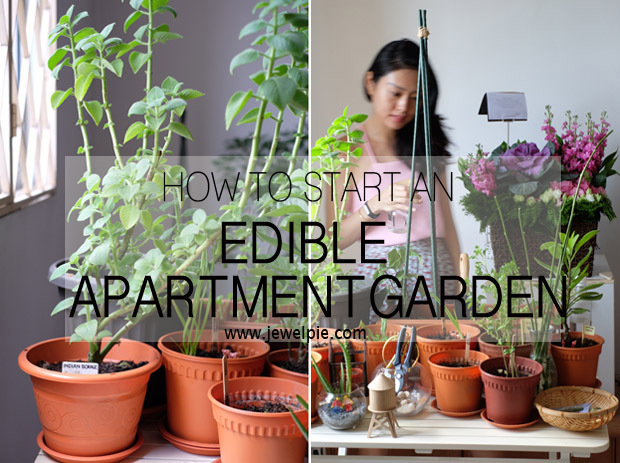 Do you always dream of having an edible garden but you are limited by space, skills and time? Me too. But I’ve learned that even if you stay in an apartment with no balcony, never planted anything in your life and have no time to tend to delicate plants – you can have a decent indoor garden. All you need is to start with just a pot of plant. When your plant survives and you’re confident that you won’t kill it, continue with the second one. Soon, you will have a collection of plants and you don’t even know how it happened! I’ve got many plants in my indoor edible garden in a matter of months. I started with air-filtering plants like Money plant and Chinese Evergreen, which I’ve moved into other parts of the house (Read: DIY: Money Plant In Glass Bottles). Now, I have a dedicated corner in the living room for my edible plants. It started on a small table I bought at IKEA where I arranged small pots of herbs. 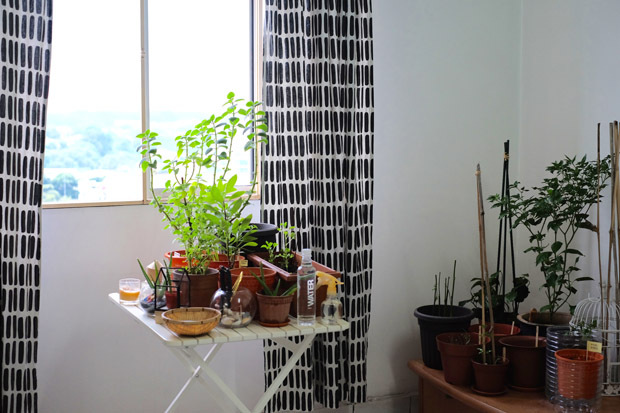 Recently, it has expanded to another piece of low-furniture to house bigger plants such as sayur manis and cili padi. The biggest challenge of indoor gardening is finding a suitable place for your garden. If you have a balcony, that should be a great place. If you don’t have one, don’t despair; with a bit of creativity, you can still have an indoor garden. Perhaps you can make a space near the window which received the most sun? Could you set up a table beside a window? Maybe there’s a window sill you can place some pots? If your place is small, you can still have small pots of herbs. Unlike fruit trees, herbs can grow very well in containers. Even if you ‘don’t have space’, you can possibly accommodate one or two pots. Be creative and never say never! What I did: I set up a small table from IKEA and place it beside the window. I’m lucky that my unit is not blocked by buildings, hence my plants receives a lot of sunlight. The benefit of placing my plants beside the window is that when the sun gets too hot, I can draw the curtain so that my plants wouldn’t dry up. When I go away for a few days, I do the same. That is because with less sun, my plants requires less water (which I am unable to give when I’m away). If you want to start an edible garden, chances is that you want to use the plants in your cooking. It’s best to start with herbs that you eat often and hardy, before moving onto more challenging plants like curry which attract pests easily. Spring onions: All you need to do is put shallots/onions in the soil. About a week or two, you’ll get spring onions which you can sprinkle over your food. Mint: A popular plant that grows very quickly. It’s smell amazing and you can use to flavour drinks or garnish dessert. Aloe vera: Another hardy plant. It’s almost impossible to kill. I didn’t water mine for almost a month and it survived. Butterfly pea: If you’re impatient but would want to plant from seeds – start with bunga telang or butterfly pea. It’s a fast grower. You’ll be excited to see how tall it grows everyday. The blue flower is used to colour nasi kerabu and pulut tai-tai. What I did: I’ve tried sweet basil, coriander and parsley. However, they died when I left them for a trip for a few days. Plants that I personally think is easy to maintain includes – Indian borage, sawtooth coriander, brazilian spinach, sayur manis and sambung nyawa (longevity spinach), aloe vera – they all survived during my short trip away. 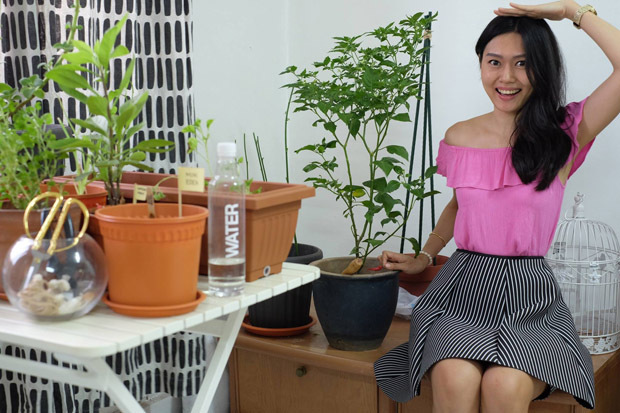 When you’ve created a suitable area for your indoor garden, it’s time to get some plants. As a beginner, I suggest getting grown plants instead of planting them from seeds. Focus on keeping your plants alive. Where to get potted plants? Family and friends: Alternatively, can also get them from family and friends. Just ask and many avid gardener will be happy to share their plants. This is the best way to get plants in my opinion. The plants are normally organic, and sometimes cannot easily be found the in the supermarket e.g laksa leaves (kesum) and wild betel leaves (kaduk). You’ll also be pleasantly surprise how your new hobby draw you closer to someone you didn’t speak much to before. Community Garden: Look around for community garden near you which may provide you with seedling or plants. 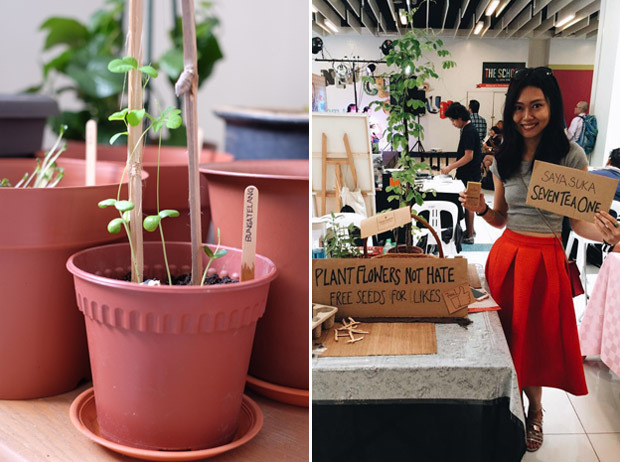 If you live in Klang Valley, you can get free plants from Free Tree Society – a non-profit organisation that give free plants away simply to encourage the love for nature. 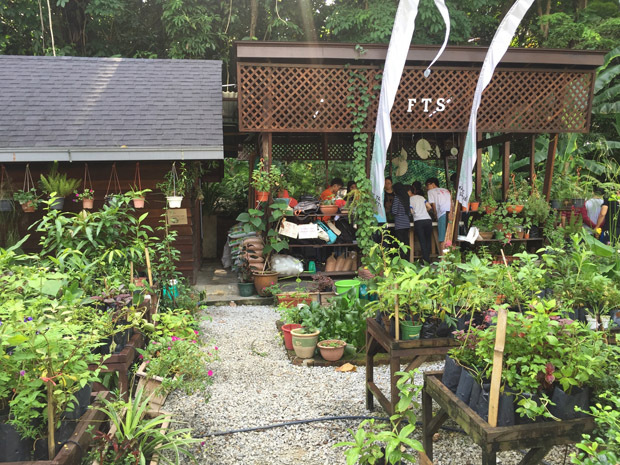 About every two months, during environmental day, they’ll giveaway free plants to the public. Do follow them on Facebook. 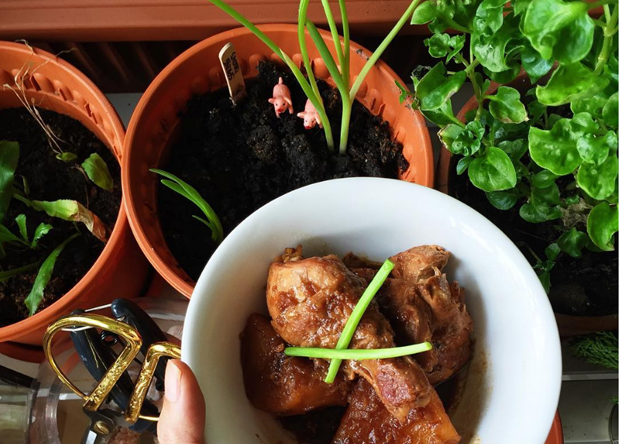 What I did: I started with a nice pot of sweet basil and coriander from Cameron highlands. I’ve received some plants from friends and relatives – curry leaves and cili padi. I’ve also gotten some plants such as Indian borage and Sambung Nyawa from Free Tree Society. You will need some tools to help keep your plants healthy. 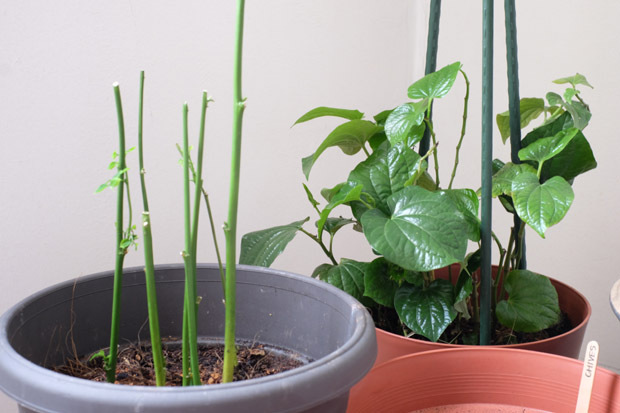 Here are a few basic tools that you need for your apartment garden. You probably have most of them at home. If not, you can ask around for unwanted ones or get from hardware stores/supermarket/ nursery/ Daiso/ IKEA. 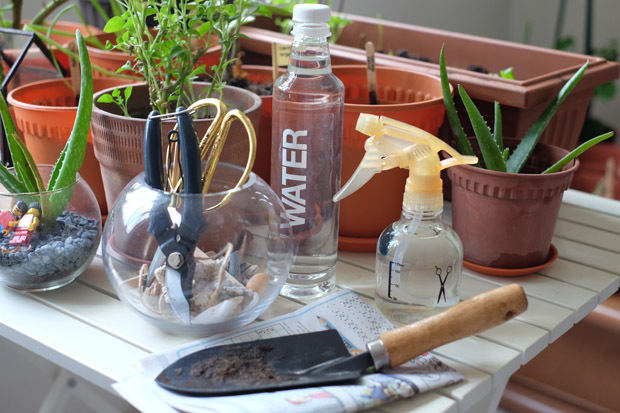 Water bottle/ watering can: To pour to the soil so that it’ll go to the roots of your plants. Spray bottle: To lightly mist leaves on your plants. Hand spade: To repot plants, adding more soil into pots, etc. Scissors: To trim the leaves or harvest plants by cutting. You may have to get a secateur to cut thicker branches. Newspaper: If you don’ t have a balcony, you probably have to line the floor with newspaper so that you won’t dirty the ground. What I did: I’m still slowly collecting my gardening tools. I want to invest in tools which I like and truly need, and most importantly of good quality. Remember I wrote how Marie Kondo’s Minimalism Makes me happier and my goal on living a quality life? Except for my secateur, I didn’t buy any gardening tools. I use recycled mineral water bottle as watering pitcher and it is serving me well. I don’t believe having a flourishing garden depends on whether you have ‘green fingers’ or not. If you’re willing to learn how to care for your plants, they will not only survive but thrive. You can know very little and your garden will still be ok if you know the basics: give it sunlight, water and soil. Speak to avid gardeners: Talk to family and friends who enjoys gardening. As gardening seems to be like a forgotten hobby nobody talks about, when you show some interest, I assure you passionate gardener will be happy to shower you with their knowledge. Join a local community on Facebook: Join Malaysia Gardeners group on Facebook. It has more than 18 000 members. Everyday, you’ll get to see photos of other people’s gardens and learn new gardening tips. You can share photos of your plants and seek advice too. 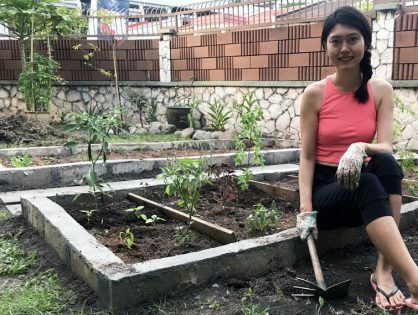 Join a community garden: If you live in Klang valley, consider volunteering at Free Tree Society every Tuesday or Saturday morning at Bangsar. Also look out for events at Eats, Shoots & Roots. 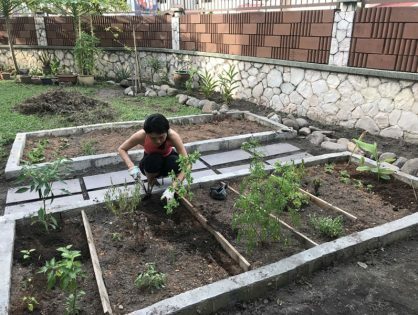 They came up with an informative guideline on planting edibles in KL: What can grow in downtown Kuala Lumpur. What I did: I did all the above. 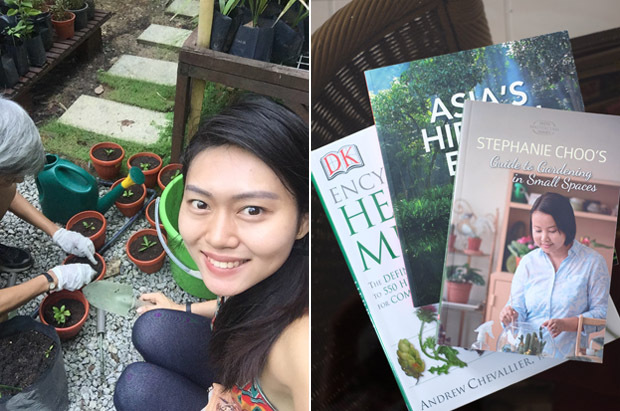 The few books that I’ve read includes Guide to Gardening in Small Spaces, Encyclopedia of Herbal Medicine, 100 Useful Herbs of Malaysia and Singapore and Asia Hidden Eden. Gardening is such an exciting hobby, and one that rewards you with food and flowers. One day it’s just a seed, and another day it grow into a sprout. The landscape changes all the time too as plants grow bigger, flowers turn into fruits, and leaves wither away. Do remember to record your gardening journey. 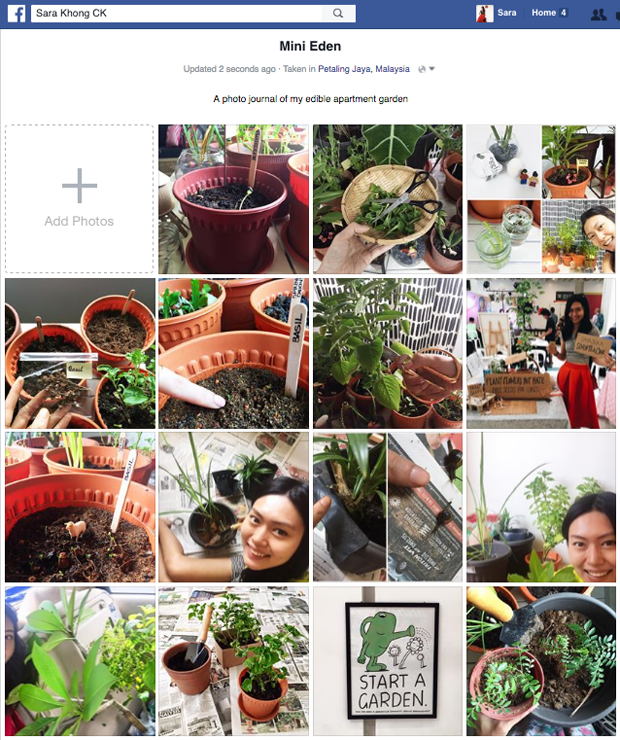 I did mine in Facebook by putting photos of my plants in a folder called Mini Eden. It’s such a joy to see how much your plants grow and how your garden changes. Don’t wait; start your garden today!